I don’t know anyone who doesn’t love the sweet taste of ice cream as it melts in their mouth. 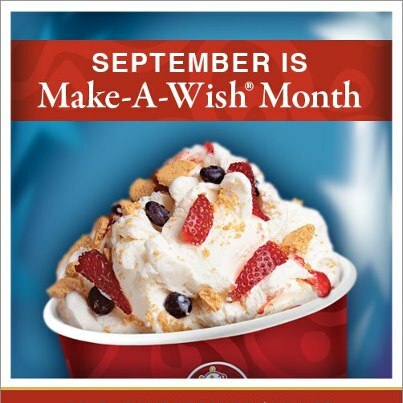 Even better than enjoying a cup of nice, cold ice cream though is knowing that your purchase of a nice, cold fall treat is going to help make wishes come true for children facing life-threatening medical conditions. *For the past 10 years Cold Stone Creamery has hosted the World’s Largest Ice Cream social each September. Funds raised from this event exceed the $4 million mark – making it possible for the world’s largest wish granting organization to make hundreds of wishes come true. Tomorrow you too can help make wishes come true. One dollar from the sale of any Love It or Gotta Have It size Ice Cream, Yogurt or Sorbet Creation™ will be donated to Make-A-Wish. It’s no secret that I have a soft spot in my heart for the Make-A-Wish Foundation. Trying to think of my favorite wish that was granted during my nearly five years with the Foundation would be impossible – there’s just too many great ones to chose from. But in witnessing the power of a wish… I believe. I believe that something as simple as buying a cup of ice cream truly can make a difference in the life of a child looking to make it another day. So join me, why don’t you – and let’s help to make wishes come true!